Some of my favorite episodes of television are “bottle episodes”; where in order to save costs on its production budget, a series may employ a script that finds it core cast centralized onto a pre-existing set for an entire episode’s running time. One of my go-to examples is the early Doctor Who serial “The Edge of Destruction”, which in lieu of another time travel adventure and location, the producers used the occasion to build the personalities and relationships of its cast. In this brave new world of the ongoing serialization of cinema instead of the individual unit, it should come as no surprise that we’d find Marvel employing similar tactics. Though don’t let that statement fool you into thinking the sequel to 2014’s smash-hit Guardians of the Galaxy is some sort of shoestring affair, there’s no way Disney and their assorted bean counters would ever let that stand. No, this self-styled Volume 2 is instead an even lusher feast than the first visually, with more inventive space battles, various alien races, and neons and fuchsias than you can handle. But where the sequel isn’t turning the volume up on its predecessor’s various strengths (or its AM radio dial), it’s instead trying to occupy a space that finds its characters somewhat stuck in stasis. Because the assorted Guardians can’t really do a lot within the confines of the Marvel megaplot until next year’s Avengers: Infinity War, where the big Thanos-shaped elephant in the room finally will make some noise again, director James Gunn instead has to pull on all of the inner conflicts that were bubbling under the surface in the first film, but were somewhat drowned by the machinations of the usual origin tale that this studio produces. Guardians of the Galaxy Vol. 2 is all about intimacy, both of the physical kind, of which the film’s story centers on, and developing the relationships of various members of the team and their associates. Of the former, the sequel pries its eye toward something that really only played a small part of the film the preceded it, the paternal side of Peter Quill’s parentage. On the run from a (gold covered, how appropriate!) alien race called The Sovereign, of whom the Guardians have run afoul thanks to that scamp Rocket, our heroes are saved by a mysterious stranger waving from out in the vastness of space, riding on top of a rounded ship that looks like something right out of the animated Heavy Metal. This is how they meet Ego, played by a bearded Kurt Russell, who comes in and injects some really intriguing energy into the proceedings – a spectacularly swaggering presence that livens the “where do we go from here?” core group and also shakes up quite a bit of our understanding about Peter. From that character connection, we’re able to have a better understanding of what makes Michael Rooker’s Yondu tick, and in turn how that impacts Rocket, turn the corner and you’ll also find a beautiful little examination of the dynamics that drive Gamora and Nebula, and if that isn’t enough, we even get to learn just a little bit more about Drax’s past by way of new cast addition Mantis, whose empathic abilities cut through that gray impenetrable shell just a tad. From that description, it may sound like this film is effectively plotless, and to a point, it almost seems that way. This is basically the Marvel equivalent of hangout film, with the majority of its action taking place in very few locations with an overriding concern for the relationships of its characters above all else. It’s a movie about people talking, and caring for one another – filling each other’s respective emotional void – just as much as it is about laser guns and punching. Eventually, the need for a big action set-piece overrides the third act (you can’t expect a tiger to change its stripes too much when there’s a billion dollars on the line), but up to that point, much of this sequel plays like a 2 hour epilogue to the previous film – even addressing a major element of that effort’s resolution that I personally hadn’t even thought twice about. It’s also just a much more enriching piece of moviemaking. I wasn’t the biggest supporter of the first, which I thought was fun, if fairly toothless and a little in love with itself, but this is the kind of sequel that’s so well put together, that you want to go back and look at the original and see what little moments you might have missed on first glance. In terms of performances, you know just about what you’re going to get from each player. Star Lord remains the lovable rogue, Gamora the element of stability in an ever irreverent fraternity, Drax is still the funniest thing about this franchise, Rocket is actually tolerable this time around (I recognize I’m an outlier here), and of course, I cannot forget Baby Groot, whose adorableness thankfully isn’t used to death by Gunn and company. But, the biggest surprise has got to be Yondu, who displays so much more nuance than could have been expected, given the fairly one dimensional tough talking alien he was portrayed as a few years ago. I think if there’s a real MVP of the movie, it’s surely Rooker – a wonderful little showcase for a long underappreciated character actor. Does it have some flaws? Certainly. Mantis, beyond giving Drax someone to talk to, doesn’t really seem to have much else to do, and James Gunn, exciting filmmaker that he is, still struggles to shoot clear action, making the moments where characters just sit to talk all the more welcome, especially since they make up 70% of the running time. But regardless of those minor quibbles, this is the rare Marvel Studios effort that bothers with a theme, centering on the ever universal struggle of “the family you choose vs. the one you don’t”. It’s not exactly Tolstoy, but one takes what they can get, especially in an ever increasingly risk-averse genre. 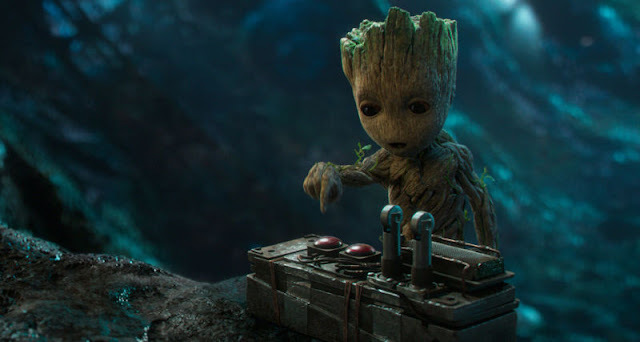 I’m very happy to say that Gunn takes advantage of the extra latitude he’s been granted, imprinting every bit of his personality onto this sequel, and hopefully this bodes well for Taika Waititi, Ryan Coogler, Anna Boden and Ryan Fleck in their subsequent outings in this universe. *Two other quick points, this has my favorite Marvel movie adversary since Loki, playing in a higher concept arena than I would have expected. And do keep your eyes peeled for lots of cameos, including some real surprises, one of which made me exclaim audibly in the theater.